Fancakes, today I’m taking you on a trip down south to the Old Dominion, the Commonwealth, the state in which five presidents were born: Virginia! And not just any part of Virginia, but the capital of the Confederacy. Richmond, Virginia, also known as the River City, is known for its famous (infamous?) history and outdoorsy lifestyle. 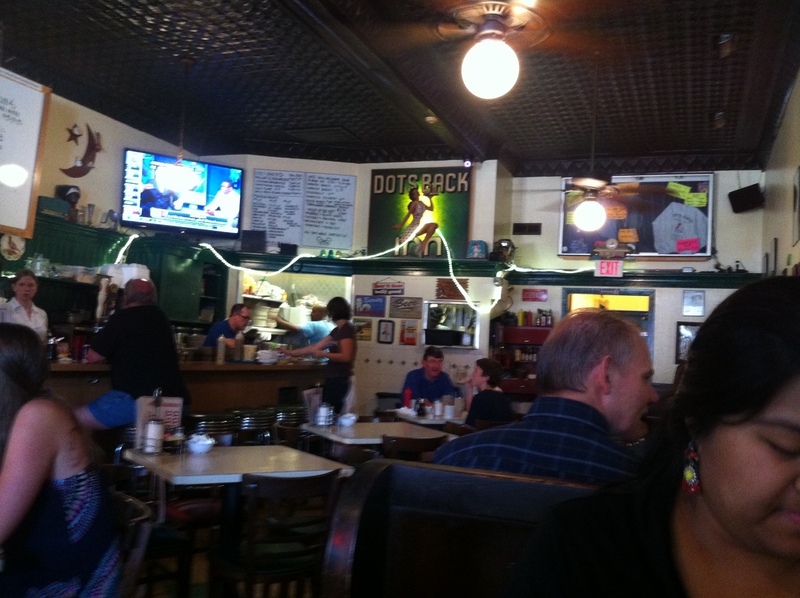 It also has pretty good food. Oh, and lots of tattoos. I think we can all agree that Guy Fieri’s Triple D is THE measure of good food. Richmond has a few places that have been featured on this show. 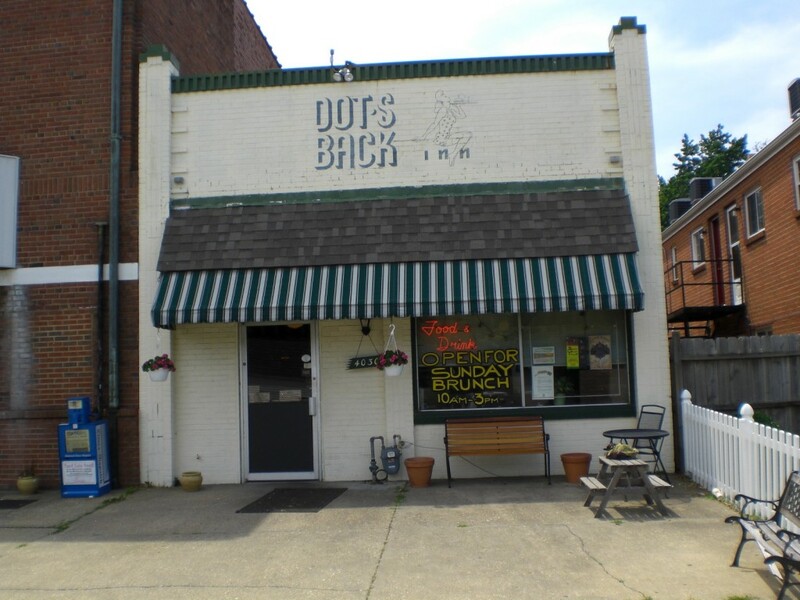 One is Dot’s Back Inn. This is where I went. The inside is nothing to write home about, but it is American. And cozy. I call it having their priorities in order! I do believe those are Christmas lights laying sort of disheveled all over the place. Very classy. Of course, I ordered pancakes. 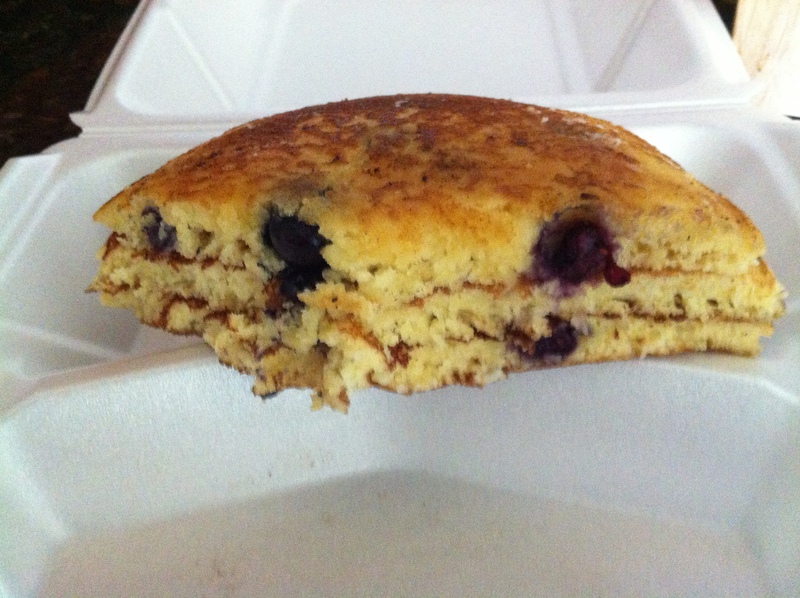 They had a ‘meat pancake’ special, but I opted for the classic blueberry. I know, I know, I just said I’m in the South – where are the griddle cakes with, like, honey and corn and grits and fried-green tomatoes on top??! Well, I decided it would be unfair to compare the superior Southern variations on things and so I stuck with classics, for fairness. First of all, this place was FAST. It was awesome. We stepped in at 10 am, ordered at like 10:05, and I swear we had our food less than ten minutes after ordering. 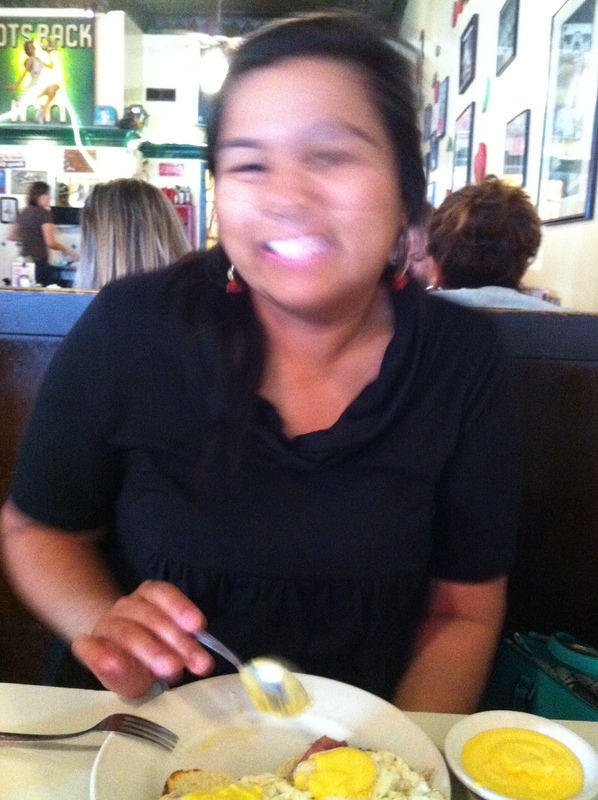 Second of all, the pancakes were delicious. Real, perfect blueberries, beautiful melted butter, amazing texture, and great taste, of course. The outside of each pancake was perfectly crisp while the inside was soft and melted in my mouth. The sweetness was spot on for me – I don’t like super sweet. The sweetness from the blueberries was plenty, so maybe if I had gotten plain pancakes it wouldn’t be sweet enough for me. This is sweetness thing is also crucial because I don’t like maple syrup, so I need the pancakes to be satisfactory on their own. And they were. Overall, it was a great experience. I had never been before, and it did not disappoint. I actually brought leftovers home, but before I put them in the fridge, I took like three more giant bites just to get the amazing-ness in my mouth again. Worth it.